Alaska Charters and Adventures has a reputation for offering the finest in high quality customized outdoor adventures for very small groups. We take great pride in our attention to detail, personalized service, and unprecedented safety standards. Choose the finest in guides to lead you to Alaska’s unsurpassed wilderness, wildlife, and fishing. I was raised in a family of Alaskan pioneers and commercial fishermen. After years of working long trips at sea off the Alaska coast, I was ready to start a family and stay a little closer to home. So I took up my next great love and started my own tour company sharing my amazing backyard wilderness and pristine waters with adventuresome travelers. This was a natural transition for me as I had worked earlier as a guide, fisherman and was pretty comfortable behind the wheel of a boat. Now, 27 years later, I hope that you can still sense my overwhelming passion and excitement for where I live. I also hope that my many years in the Alaska backcountry has made me a wiser guide and better leader, or at the very least I’ve got some really great stories to tell you! I don’t want this to sound like a resume, but I believe that credentials, training and experience helps qualify characteristics in a well prepared guide. So, here are just a few of mine. I hold a 100 ton Masters Coast Guard license and am a State of Alaska certified guide and Naturalist also a licensed State of Alaska Fishing Guide. I am a State Safe Boating instructor and Alaska Marine Safety Education Association instructor as well as a State Certified Alaska Host and Cultural Host. I have a long history of wilderness emergency medical training and have been and EMT 2 and Firefighter locally. More than anything else, I love playing outside… Camping, kayaking, fishing, hunting, climbing, diving, and hiking. If you spend a day with me in the wilderness I hope you will benefit from my extensive training and 27 years as a full time professional guide, but more than that, I hope you will catch my contagious sense of play and my enthusiasm for nature. I grew up in a small farming community in Northwest Ohio where I worked in the family grocery store, spending all of my spare time fishing and hunting. My very first boat was a small 8-foot flat bottom boat that I pulled on a trailer behind our riding lawn mower. I wasn’t old enough to drive, but that didn’t stop me from getting out on the water! While I was growing up, my Dad, who served in the Coast Guard, shared many exciting stories of his adventures that really inspired my career choice. I joined the Coast Guard after High School wanting to pursue the adrenaline and satisfaction of helping others and being part of a team. My love for the water and being on boats was an everyday occurrence that I continue to this day. The Coast Guard was also able to provide me with some spectacular fishing locations that ranged from the Great Lakes, Florida Keys and eventually up to Alaska. While in the military my family and I moved nine times when duty called, but my last move was to Alaska in 2002, then I knew I was home. In 2004 after 17 years of honorable service performing search and rescue, port security missions and training others, I retired and started a new chapter of my life. With my love for fishing and the outdoors combined with my many years at sea, the transition to becoming a fishing guide was natural. I was fortunate enough to have a family with a vast fishing background and many new friends that were eager to help me learn the ins and outs of fishing in Alaska. In 2005 I began my first season as a full time guide and captain and now 11 years later, I enjoy fishing and being on the water even more. I take great pride in my Coast Guard background and where it has gotten me today. My expertise in small boat handling, Search and Rescue and Maritime Law Enforcement afforded me the opportunity to log thousands of hours behind the wheel. From this experience, I was able to receive my 100 ton Masters license in 2004 and work toward other certifications that would make me a well rounded naturalist and guide for Alaska Charters and Adventures. Within a short amount of time, I obtained my certification as a naturalist and guide from the State of Alaska as well as Alaska Host and Cultural Host certificates. The benefits of my work are endless and I am told frequently that “I am living the dream”, and I truly believe it. I am so fortunate to have such an incredible family, amazing friends and to live in a place that many dream about. I love to take people fishing and watch their enthusiasm while sharing this amazing wilderness and its wildlife. Born and raised in Wrangell, I have always found a way to be on the water. Whether it was fishing, hunting, or going up the Stikine River with friends, I have always been outdoors. 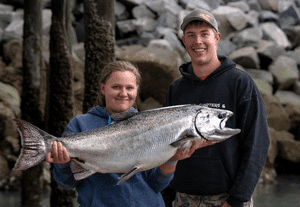 My true passion is fishing for Alaska’s most sought after species, King Salmon and Halibut. After I graduated High School, I began working with Alaska Charters and Adventures as a deckhand and assistant guide. In the spring of 2016 I received my US Coast Guard Masters license and launched my first season as a full time fishing guide operating my own vessel. In 1975 I traveled with friends to Alaska on a 3 month holiday, it was a trip of a lifetime. Who knew that 38 years later I would move to Wrangell, Alaska. As soon as I arrived on the ferry, I knew it was the right decision. I was born in New England and have always felt most comfortable in the wilderness. My earliest memory as a child is riding my bike with training wheels around the neighborhood and with the wind in my face the trainers flew off and there was no stopping me. My first adventure was fresh out of highschool, traveling for a month long trip around the country, I visited national parks from coast to coast. I have worked in the outdoor industry for 30 years, spattered through that time I have also worked in the hospitality industry. The combination has proved to be perfect for my job at Alaska Charters & Adventures as an administrative and reservation specialist. 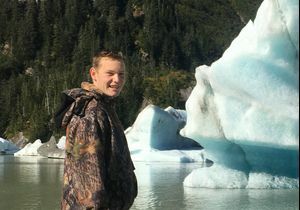 Jake is new this season with Alaska Charters. We have been watching him for years and are so stoked to have him on our team. Jake is an avid outdoorsman and almost always can be found in some kind of machine……..boats, wheelers and heavy equipment. He is very mechanically inclined and knows his way around a boat and the River. If you are lucky you will have Jake as a crewman on one of our vessels this season and I know you will enjoy his company and skills, he is easy going, attentive, capable and fun to be with! As a kid growing up in Alabama, I have always been somewhat obsessed with the outdoors and mountains in particular. This obsession led me to migrate to mountainous regions of the country after graduating from Auburn University with a bachelor’s degree in zoology From the Southern Appalachians of North Carolina and Tennessee north to New Hampshire and Maine then west to the Northern Rockies of Montana and Idaho, I have always sought out adventure and exploration in mountains. While in New Hampshire, I attended a 6 week wilderness medicine course at the flagship campus of the SOLO Wilderness Medicine Institute where I became a certified Basic EMT and Wilderness EMT with emphasis on wilderness survival. While living in the Northern Rockies of Montana, I was offered a summer seasonal job with the USFS on the Tongass National Forest of Alaska That first summer job led to a 15 year career working for the Tongass NF as a cabin and trail maintenance crew leader, wildland firefighter, helicopter crewmember, blaster, tree climber, chainsaw instructor, and boat operator. This job and my deep personal sense of adventure and exploration have allowed me to discover the many incredible opportunities that the Tongass and the Wrangell area in particular have to offer. My personal adventures in the area have taken me down the Stikine River by paddle craft multiple times, along hundreds of miles of coastline by sea kayak, to the top of many of the mountains visible from the town of Wrangell, and on many of the local streams and rivers by packraft. My favorite adventure was a 15 day trip down the Stikine River from Telegraph Creek on skis several winters ago. After my career in the backcountry with the US Forest Service, I came to work with Alaska Charters & Adventures as a captain and guide. While spending time on the water and in the forest, I have discovered how rewarding it is to be able to share my love of Alaska with others.